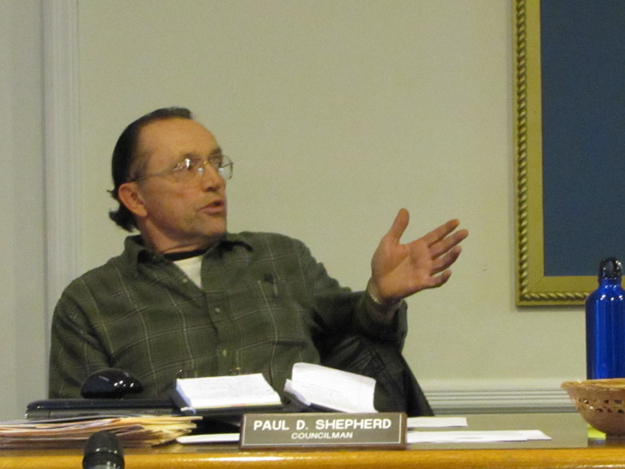 JULIE LANE PHOTO | Councilman Paul Shepherd voiced concern about proposed dark skies legislation at Tuesday’s Town Board work session. Dark skies legislation, rejected by Shelter Island in past years while being embraced by other East End communities, is back in the spotlight. Councilwoman Chris Lewis, who led the effort in 2009 to support dark skies legislation, told her Town Board colleagues Tuesday those who opposed it “did not have good information” despite efforts to get it out to the community. It was in 2009 that dark sky advocate Susan Harder of the Long Island Dark Sky Society promoted the concept to the Town Board, only to meet up with opposition that made it clear there was a dim chance of any further action. “We decided on a new draft of the idea and to make it as simple as possible,” Ms. Lewis said about the latest legislative version drafted by Town Attorney Laury Dowd at the request of the ZBA. The draft has a grandfather clause allowing residents to retain lighting they have for up to 10 years. and basically calls for shielding lights that they reflect downward rather than out. The proposal also separates out requirements for commercial buildings from those for residences and affords the Town Board the authority to make decisions about special sites that don’t strictly fall into the other two categories. Shelter Island is the only one of the five East End towns lacking some kind of dark skies legislation, Ms. Lewis told her colleagues. “Are you feeling left out?” Councilman Paul Shepherd asked her. He was among those who, although not a Town Board member back in 2009 when the idea died, raised issues about whether such legislation was an overreach on the part of government. “I didn’t like what I saw,” Mr. Shepherd said about a fairly technical proposal that was being considered in 2009. His viewpoint at the time was that it could “pit neighbor against neighbor” and encourage government to become involved in an area where it didn’t belong. “We’re trying to head off a problem before it occurs,” Ms. Lewis said, noting there are more large houses on Shelter Island and owners tend to install more lighting as a means of security for their property. “The whole idea of light intrusion is new to us,” Ms. Lewis told the Reporter last week. She also said that there have been studies revealing that more lighting doesn’t necessarily go hand-in-hand with greater safety. Ms. Lewis said last week she wouldn’t be spearheading the effort to enact such legislation this time, but as Town Board liaison to the ZBA, she was simply providing background for the revised legislation that the ZBA is studying. “This is not going to be my personal cause,” Ms. Lewis said last week. Ms. Lewis said she doesn’t envision the proposal becoming a “hotbed” political issue in this election year. On Shelter Island, no matter what you support, there are going to be people who agree and others who don’t, she said. ZBA chairman Doug Matz told the Town Board Tuesday what motivated his members to ask for legislation is the number of projects where neighbors have raised issues about lighting. “It wasn’t necessary at the time,” he said about prior efforts to adopt dark skies legislation. But now, it’s “vital to keeping the Island the way it is,” Mr. Matz said. “Walking down the street on Shelter Island can be a harrowing experience at night,” Mr. Shepherd said. He wondered why there’s a need for a law when only some people are affected by wayward lighting. That’s the case with any law, Ms. Lewis said, trying to assure him that the dark skies law wouldn’t be enforced by having police patrol and inspect lights. Instead, a neighbor’s complaint would generate an investigation, she said. “I’m always leery of laws where we say it’s not going to be enforced that way,” Mr. Shepherd said. “Do we really have problems here?” he asked Mr. Matz. It’s not “massive” but it’s “growing,” the ZBA chairman said. “If you just let this go, at some point you’re going to lose the ability to walk down the street and have dark skies,” Mr. Matz said. “It may not seem so, but I really have an open mind,” Mr. Shepherd told him. The Town Board will continue to discuss possible dark skies legislation at next Tuesday’s work session.